In addition to the major judicial review (JR) led by Professor Allyson Pollock challenging the illegality of introducing Accountable Care Organisations without primary legislation, and circumventing parliamentary debate, there are legal challenges up and down the country. 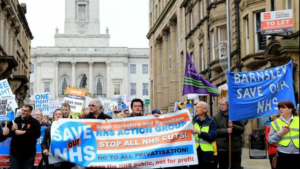 These are one important component of the array of methods campaigners are using to challenge the assault on the NHS from the combined attack of de-funding and privatisation. They all cost money, but they are important and we ask KONP supporters to spread the appeal, share on social media and, if you are able, please donate. Judge Mark Gosnall agreed there were important matters of law which must be tested in a full Judicial Review. We expect the hearing to take place in June. The Hospital Trust has so far considered itself to be beyond reproach but they will now have to account for their proposals in court. This is a huge blow to the Trust and a massive victory for the people of Huddersfield who have stood shoulder to shoulder with this campaign. It has taken two years of hard work and perseverance to pull this off but we have been rewarded. Our campaign group will now be shifting up a gear to ensure all possible approaches are explored to win this legal case. Of course we still await the outcome of the Independent Reconfiguration Panel which is now with the Secretary of State but undoubtedly this legal case will focus his mind! Of course this is not the end of the road; we now have to win our Judicial Review but our legal team are up to the challenge and we know we will continue to have your support. This challenge has local and national consequences. It is the first serious legal challenge of its kind. If we win, it doesn’t just help our hospital, it will give encouragement to all campaign groups fighting for their own services. However we will need ongoing public support. We estimate we need to raise another £10,000 to bring our legal case and that is where you come in. All supporters can help us in our next phase of fund raising. We have now proved this is not a done deal and that People Power CAN work. Join our facebook page; organise your own fund raiser or just donate to our legal fund (details below). 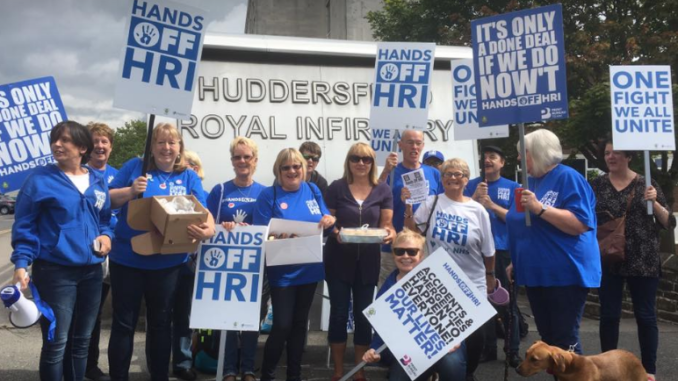 This is a fight for Huddersfield and the wider NHS and we can win. Let’s do this together. HANDS OFF HRI!! 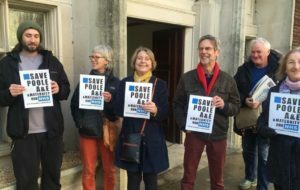 Local campaigners are delighted to report that they have been granted a Full Hearing for Judicial Review (JR) into Dorset CCG’s plans to downgrade one of the county’s three A&E’s, close one of three maternity units with a second under threat, close community hospitals and/or beds in 5 of 13 Dorset locations, and close 245 acute beds! Poole Maternity site appeared in Poole local plan as ‘existing site allocated for development’ in June 2016, 6 months before the ‘Consultation’ on the changes even began. Unsafe Travel Times: That the plans to downgrade Poole A&E and close Poole Maternity will move emergency and Maternity services out of safe reach for tens of thousands of Dorset residents. We have a Claimant who has been granted legal aid who is severely affected by the loss of Poole A&E, as her condition can deteriorate rapidly, and potentially be fatal. She is blue lighted to Poole regularly (8 times last year). Failure to meet Beds Duty: That it is unlawful for Dorset CCG to close NHS beds without having replacement staffed services in the Community that are proven to reduce the demand for NHS beds. That aspects of the Consultation were so misleading as to be unlawful. There is another group in Dorset who are aggrieved about the Local Government Unitary Authority Consultation. This was carried out by the same company, Opinion Research Services, who did the Consultation on the NHS cuts. This group are starting JR proceedings having been advised that it is illegal to create, or use, a Consultation designed to give a defined outcome. If you have any evidence that may support our case, for example research references evidencing delays to treatment cause increased mortality and morbidity, or references showing that the benefits claimed for centralisation of services are exaggerated or untrue, please let me know! Both campaign groups are seeking to raise funds to support this challenge to the closure of the emergency stroke services at both their local hospitals in South Yorkshire.